I have recently purchased a Poodle and have gone to several local dog shows. I noticed in the show catalogs that many of the dogs were being shown by people other than their owners. These people had titles such as Agent, PHA Handler, DHG Member, and AKC Handler. What is the differences between these people? What should I look for in a professional? Do I really need a professional to show my dog? You've asked some good questions about one of my favorite topics: dog shows. Let me give you a brief tutorial about dog show handlers. First, handlers are individuals who manage to present dogs well enough in the show ring to win consistently. Therefore, owners are willing to pay these individuals to have them present their dogs for them. Many fine dog handlers have no affiliation with a group such as the Professional Handlers Association (PHA), or Dog Handlers Guild (DHG), however, members of these organizations have been thoroughly checked out before being allowed into the membership. They have been observed in action at shows, have had their kennels inspected for cleanliness and safety, and in most cases, have been able to provide references from satisfied clients. Do you need a handler? That depends on a number of things. Do you know what you're doing? It takes some time and practice to learn ring procedures. You can take classes at your local kennel club and you can also observe from ringside to see what the professionals do. Can you groom your dog to look as good as the competition? 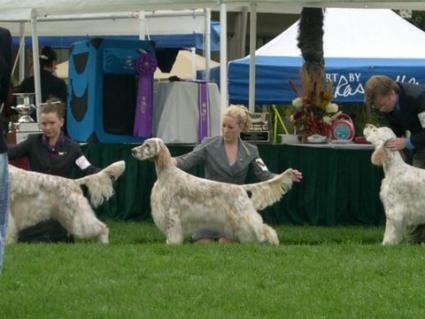 Grooming takes dedication, as well as talent, but many owners are quite capable of grooming a show dog to perfection. Again, watch from ringside to see what the winning dogs look like and try to emulate that. Will your dog respond to your directions? Sometimes dogs, like children, simply behave better for others. If your dog would rather play around than keep his mind on the business at hand, then the services of a handler may be useful. Are you comfortable in the ring with spectators watching? This is usually the determining factor for most owners. Whether or not they can groom and show their dogs competently, some owners simply find it too nerve wracking being in the ring, while other owners relish the experience. You'll only know which group you fall into if you give it a try. Hopefully this has answered your initial questions about dog handlers. I recommend you first give showing a try yourself. You may really like it. If you decide a handler is the way to go, you should watch to see which ones are winning with your breed. Then try to speak with the dogs' owners about their experience with their handler. A stamp of approval from one of the dog handler organizations can bring peace of mind, but it isn't a guarantee that this will be the right handler for you. Owners who stay in the game often use a number of different handlers over the years.